Buyers of vessels are entitled to a VAT Exemption Regime on vessels used for navigation on the high seas. Recently, the Italian Central Revenue Agency clarified the conditions for obtaining such exemption. A new regulation define which vessels qualify as vessels used for navigation on the high seas introduced by a new regulation. 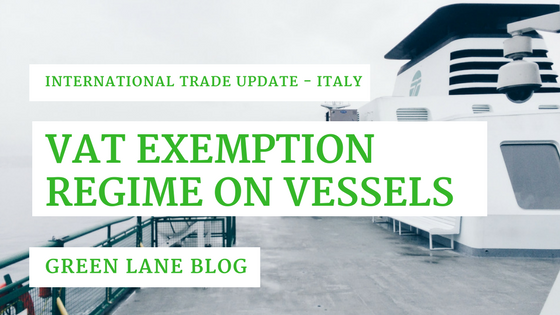 This blog post explains the application of the revised regime for VAT Exemption regime on vessels applicable in Italy. For the first time, the Italian Central Revenue Agency, by circular January, 12th 2017, clarified the concept of “vessels used for navigation on the high seas”, for the purpose of the application of the VAT exemption regime, disciplined by Article 148, lett. a), c), d), Council Directive 2006/112/EC of November, 28th 2006. This Article has been adopted by Italian legislation under Article 8 bis, lett. a), Presidential Decree n. 633 of 1972. This provision establishes that the sale of vessels used for navigation on the high seas and used for the purpose of commercial, industrial or fishing activities, or for rescue or assistance at sea, is exempt from VAT. The European Court of Justice affirmed that objective features of a vessel, as the length and the tonnage, are not relevant to obtain VAT exemption, but the only relevant circumstance is real and concrete use of the craft (ECJ, March 21st 2013, C-197/12). Consequently, the Italian Revenue Agency stated that a vessel is “used for navigation on the high seas” only if the year before the sale it has done more than 70% of travels in high sea (beyond 12 nautical mile). This condition has to be verified on the base of official documentation. If the craft is under construction and it has never travelled, the VAT exemption shall apply only if the ship owner declares that the vessel could be used for navigation on the high seas. If the craft, after one year from the launch, has not be used for navigation on the high seas, the Revenue Agency could pretend the payment of VAT. Do you have a question or comment about the new VAT exemption regime on vessels applicable in Italy (or in any other EU Member State? If so, please fill in our contact form, email us or leave a comment below this article.